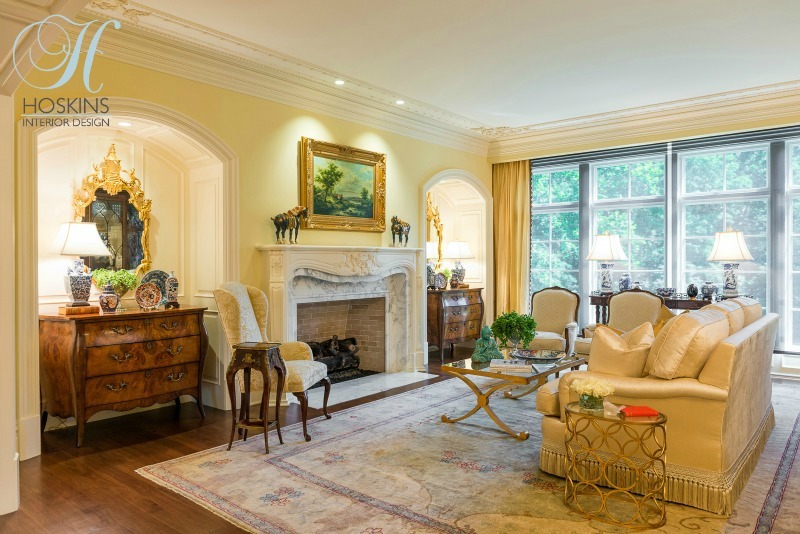 Antiques offer many opportunities to bring a unique look to the interior design schemes of today. The features found in the many styles of European antiques bring visual interest to a space, and certainly stand out as conversation pieces when guests arrive. The design and craftsmanship of antique furniture and antique accessories is difficult to match in those made in more recent times. While we would love for you to include only antiques when decorating your home, adding just a few can elevate the whole look. Below we offer some lovely examples of how our clients have included antiques in today’s interior design scheme. These homeowners were keen to create a warm and welcoming French-inspired look to their new home. Architectural detail was also at the top of their wish list, and their builder and interior designer took every opportunity to make those additions. The wide nooks created to flank the custom fireplace mantle were the perfect spots for antique bureaus, which provided display surfaces for pieces of their antique Imari porcelain collection. The older pieces are paired well with new custom furniture, bringing a richness to the light and airy space. Many homes built today are created in grand scale – lofty ceilings, tall entries and doorways, and large open spaces. It can be difficult to find appropriately scaled furniture to fill these homes! This antique cabinet was the perfect piece to help cover this huge wall in a French-country inspired design scheme. The interior designer also found lovely antique wall sconces to flank the large piece, allowing the cabinet to serve as the focal point. 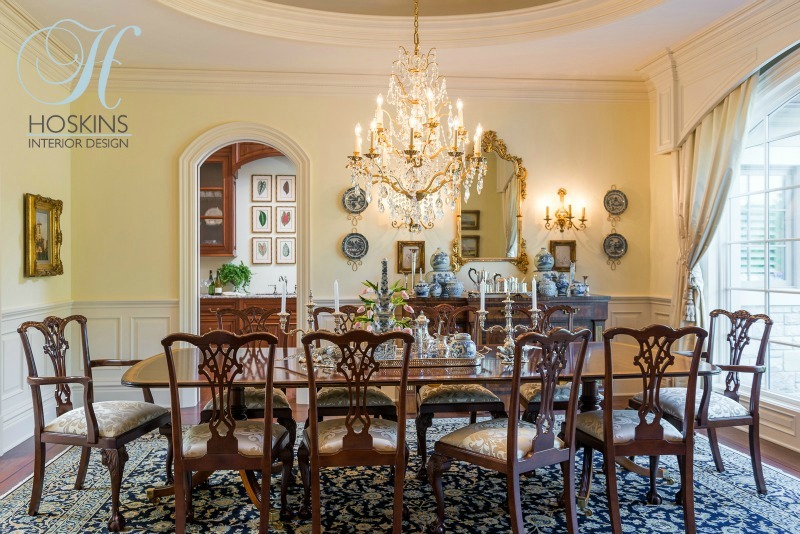 One of the first rooms you come across in this home is the gorgeous dining room. The Chippendale table and chairs, which include ball in claw feet, set the tone for the rest of the room. An antique crystal chandelier adds the jewelry, with its sparkle and light seen both during the day and when it is lit for evening dining. An antique silver tea set and candlesticks bring additional bling. Tall narrow spaces can be particularly challenging to fill, especially when there are many of them. 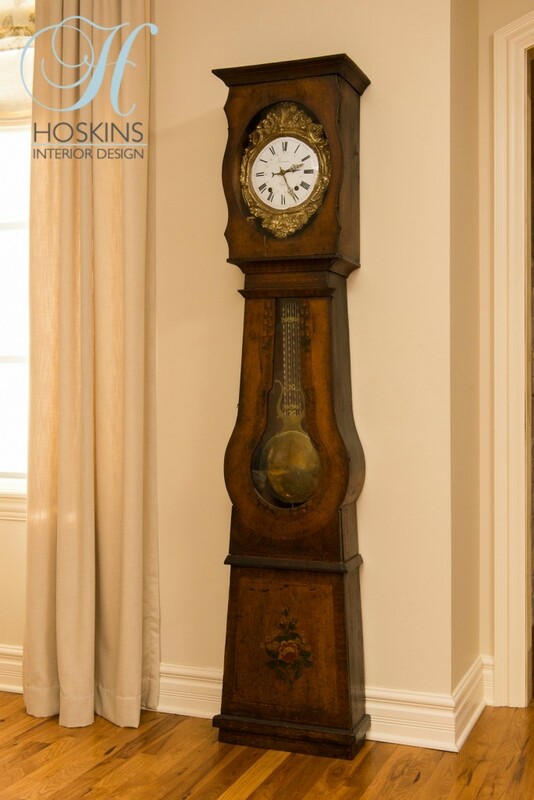 Antique tall case clocks are a good option; it is easy to find one that is scaled to the space, their exquisite craftsmanship is like adding a piece of art to your room, and their chimes tend to become part of the memories your family keeps from living in your home. 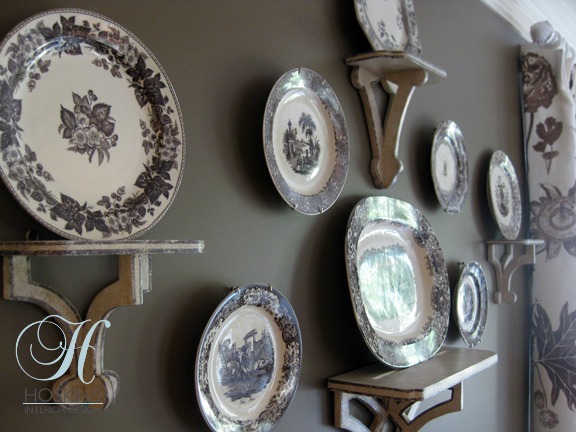 Antique accessories are a great way to bring a new texture, shape or color into a space. These homeowners complimented their rich chocolate dining room by hanging a set of brown and cream antique china on one of the walls. The cream contrasted well with the deep color, adding some needed light to the space. The china served as inspiration for the fabrics chosen for the window coverings as well. Creating an interior design scheme that truly reflects you is not an easy endeavor. Furniture and accessory showrooms and websites seem to carry the same look. Who wants their house to look just like all their neighbors’? Adding antiques to your interior design scheme is a great way to bring unique elements into your home. They come with a rich history, superb craftsmanship and one-of-a kind styling. Browse our website or stop in our Greater Indianapolis showroom to discover the possibilities. If you let us know what you are trying to achieve with your interior design, we can lead to you the perfect piece. Thank you to our long-time partners, Hoskins Interior Design, for sharing their lovely photos with us.